The second type of leak is caused by ice dams. You would typically experience this type of leak in the spring thaw or on sunny or mild winter days. Older homes are especially prone to this type of leaking due to our extreme climate and weather patterns. Ice dams will generally form at the eaves edge of a house as well as in valleys. When snow melts the water runs down the roof re-freezes at the overhangs and forms an ice build up. As more snow melts, more water runs down the roof and meets the ice build up or dam and backs up under the shingles and into the attic. 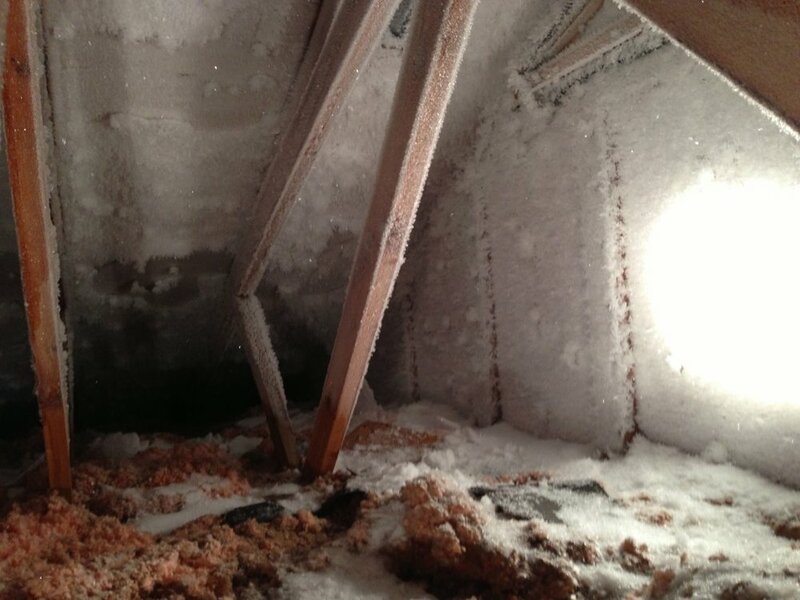 The melting snow is often caused by warm, moist air escaping into the attic due to a poor vapour barrier. This type of leak is not workmanship related and is not covered under labour warranties.